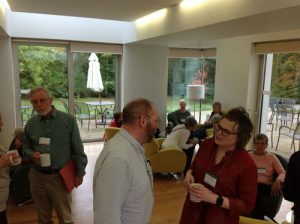 The 2017 Conference was held from Tuesday 10th – Wednesday 11th October, our second residential conference at Woodbrooke Centre near Birmingham. 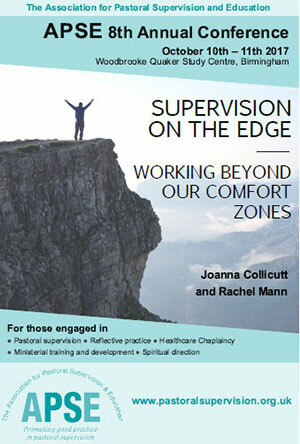 ‘Supervision on the Edge – Working beyond our Comfort Zones’ provided rich possibilities for learning and reflection with key notes addresses by Joanna Collicutt and Rachel Mann, a variety of workshop options and our 2017 AGM. Being an introvert, deciding to attend a conference where it was likely that I didn’t know anyone was a bit risky. I had come across the conference back in the summer when doing a bit of on-line research about supervision training. Bob Whorton had raised my curiosity during a conversation in May. I had hoped to attend one of the taster courses but the dates always clashed so it left me with no option but to dip into the conference, although the title, “Supervision on the edge” and the guest speakers were a real draw. I wasn’t disappointed. 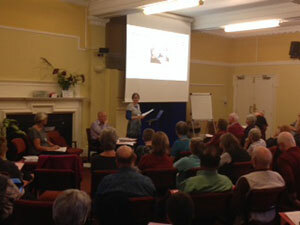 Having been involved as a volunteer chaplain within Cornwall’s hospices it was a rare treat to listen to Joanna Collicutt and feed on all she brought to us about living well in the end times. She was very thought-provoking and I loved how she weaved her way using scripture, theology, images, the fears and hopes. Rachel Mann’s sessions enthralled, challenged and enriched me. Such profound wisdom as she shared from her own experience. My notes are full of heavy underlining and asterisks, which is a sign of a ‘very alive’ session for me. The reflection group following Rachel’s sessions was a very moving time personally and so very carefully led and held by the group facilitator. The workshops I attended were very helpful: one giving plenty of materials and ideas from the facilitator, the other an opportunity to walk with all that was going on within me, the labyrinth, which I am very grateful for. Despite my initial fears I found the two days a great opportunity to meet new people, chat about pastoral supervision, spiritual direction and a whole host of other things; the meals and fellowship were lovely. Whether I can make it to York next year is an unknown but I am seriously contemplating taking the risk into some training! I attended the APSE Conference for the first time this year. I was warmly welcomed and found the group attentive to each person’s needs and giving space for each person’s voice and point of view. It was a wonderfully diverse group of trainers, clergy, therapists, counsellors, spiritual directors and others, all interested in creating reflective space in which meaningful learning might happen. 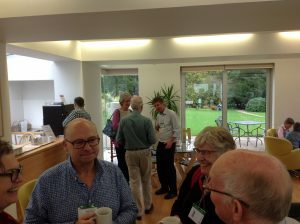 It was also a good opportunity to network and establish new relationships. While the speakers did not address clinical aspects of pastoral supervisory practice, per se, they spoke into topics that every ‘facilitator of care’ needs to think about and wrestle with. The theme, ‘Supervision on the Edge – Working Beyond Our Comfort Zones’ was well demonstrated through the subjects of ‘Walking the Last Lap Together: conversations about death and dying’ and the ‘The Body Does Not Lie: meeting queer bodies on the edge’. The speakers stretched the participants’ boundaries of understanding with challenging concepts. This was a conference well worth attending and I encourage those who haven’t yet attended APSE conferences to take advantage of this opportunity for professional development and connection with other practitioners. I loved being at Woodbrooke, everything about the place is of beauty and care. I enjoyed the hospitality, the nature surrounding-rich in autumn colours, good food and kind people. It felt gentle and nurturing. The first speaker Joanna Collicutt spoke deeply and with clarity about ‘Walking the last lap’ into the parts of our being we hesitate to look at, the places we find hard to accept and recognize. I felt the illustrations of pictures, scripture and dying the most poignant. The reflection groups and seminars I attended were challenging, encouraging, accepting and healing in equal measures, allowing the conversations to take place. I feel thankful and privileged to have had the opportunity to take part in these two days, I would like to convey my personal thanks to the speakers and organizers for being willing to step out of their comfort zones to enable me to step out of mine.